Twitter can be a helpful resource for anyone promoting their business online. In fact, many CEOs and company executives use Twitter to keep in contact with their customer base and give their business a more personal feel. But Twitter isn't just for major companies, anyone can use it! In fact it's a great resource for online artisans looking to drive business to their shops. Note: This is just a simple introductory guide to Twitter, and in no way covers all the aspects of this micro-blogging service. 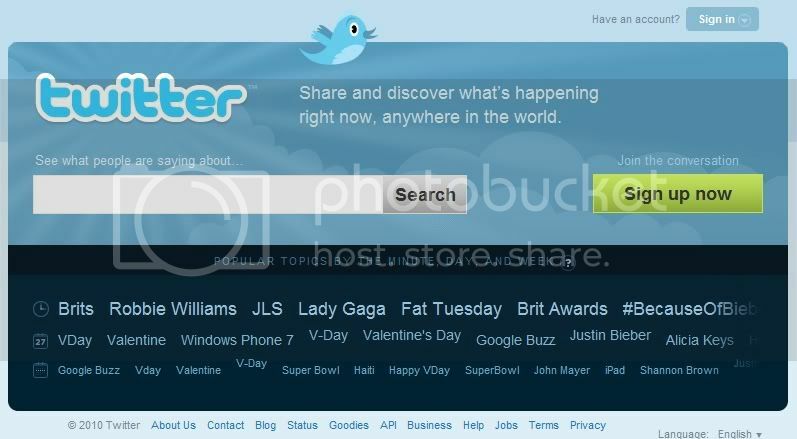 If you don't already have a Twitter account, just visit www.Twitter.com and follow the links to get started. It's a good idea to register the same Twitter name as your studio name. Doing this will help build your presence online by offering a consistent face for your brand. It might also be a good idea to checkout Twitter's Introduction Guide (there's even a video!) to help you get the feel for how the system works. Once you're signed up, it's time to start thinking about following people. Chances are, when you first signed up with Twitter, they recommend some big name Twitter users to follow. These are random recommendations from the site, and are usually celebrities or big companies. You can choose to "follow" these users, meaning you'll receive their updates in your timeline. However, this doesn't mean they'll receive your updates in their timeline. In order to receive your updates, they'll have to follow you. The more people who follow you, the more people receive your updates. For example, if you choose to post a link to your shop on Twitter and you're being followed by a lot of people; all of those people currently online will see your link. That means more people clicking on your link rather than just a handful. Of course, you shouldn't just follow everyone on Twitter. You want people who will be interested in your posts to follow you. This might require a little research using the Twitter Search for keywords, which is available on the right panel of your Twitter homepage. You can also use applications like twit-seeker to find people who talk about things you like, or do searches on Twitter to find discussion you might jump in on. However you choose to build your followers, get engaged and involved. The people you follow can be viewed by clicking the following link below your username, while the people who follow you can be viewed by clicking the followers' link. Once you have a few followers and are ready to start promoting your business, you'll need to know what kinds of things to tweet about. A common mistake online sellers will make is to post a link to their shop with no information or introductory text. While people may see this link, it's not likely that they will click on it. To entice people to follow your links, you'll need to intrigue them. Simply writing, "Just listed" followed by a link is not likely to attract much attention. Try asking a question or saying something funny. For example, if you are selling a pair of snowflake earrings you want to promote on Twitter, you might say something like, "Prettier than slush earrings!" or "Wear them in July, you'll feel cooler!" or even "Just like your ears, each one is unique!" with a link to your item. These expressions grab shoppers' attention more than "Just listed new snowflake earrings" with a link to your shop. Keep in mind that you only have 140 characters for each posting, so whatever you post with your link needs to be short. You'll also want to personalize your Twitter account. Post updates on your life and opinions as well as links to your items. This way your followers have a chance of establishing a personal relationship with you and seeing the artist behind your work. Tweet about your family, your job, and everyday life. For example, you could post things like "I just got a new puppy!" or "I'm going to the DMV, cross your fingers for me," to generate discussion on your Twitterfeed. It is important that people following you see you as a real person, not just an eâ€commerce site. Of course, there's more to Twitter than just posting links and updates. You can also talk to individuals using @Replies and Direct Messaging. @Replies allow members to respond and talk directly to other members on the public feed. This is helpful for responding and even carrying on a conversation with other users. To respond directly to another Twitter member, just type @ followed by their Twitter username. This way these posts will show up in that user's @replies section of their Twitter page (which you can access by clicking the @Replies link on your Twitter control panel). Direct Messaging allows you to send a private message to another member. You can send and receive messages by clicking on the Direct Messages link in your Twitter control panel. Some users like to send Direct Messages to new followers, introducing themselves and linking to their shop. Still Confused about Direct Messages and@Replies? As our COO Tony Ford Explains it: A Direct Message is like passing a note in class, while an @Reply is like standing up and shouting your message to another person. A Direct Message is private, an @Reply isn't. Direct Messages are good for personal conversations which are closed to the community, while a @Reply might be better if you don't mind others joining in your conversation. For example, if another user posts a link to one of their items and you wanted to compliment it, you might send an @Reply stating how much you like that item. That way, other users can see it. However, if you wanted to request a special order from that seller, you might want to use Direct Messaging. It should also be noted that if a user isn't following you, you can't Direct Message them. However, you can @Reply them. Tweetdeck - A useful downloadable application that helps categorize and aggregate your normal Twitter page. Being able to display all tweets, @responses, DM's and specific search terms in columns will make you wonder how you ever got by without it. Twit-Seeker- This is one of the easier programs to use to find new people to follow who are talking about the things that interest you. Search "handmade" or "stained glass" or any number of keywords and you'll be shown up to 25 people at a time who have been talking about that keyword. SocialOmph - Another great tool to help you manage your Twitter account which you can use to schedule future tweets for your Twitter account. This is a helpful trick if you want your account to be active but aren't going to be able to update it. You can set up tweets with fun finds or other non-time sensitive tweets to keep your account more active. New users should probably spend some time getting used to Twitter before investigating tools. This will help you understand what kind of services you can use to make your tweeting experience better, and what will only make things more complicated. Sadly, there is spam on Twitter. These can come in the forms of bot Twitter accounts with suspicious names such as, "Freemoney$$" or "SaveBigonCars." It's best to avoid these accounts, as they can send you automatic direct messages if you follow them with links to spam sites or virus. Always be wary of a link you receive in a direct message or tweet when you do not know the user or recognize the URL. If the offer appears to be too good to be true, it probably is. What Else Can I do with Twitter? Once your Twitter account is set up and ready to go, hit the forums! Use some of your other social venues to let other sellers know your Twitter info. There are several threads out there of people just sharing their Twitter usernames. Go though and follow your favorite shops, and be sure to post your Twitter name so others can follow you. Also, don't forget widgets! If you're a Pro member of ArtFire you can add several different kinds of widgets to your studio to help your buyers find you online. You don't need to use Twitter just to promote your studio. You can use Twitter to promote your blog, website, or even social media profile! You can also use Twitter to get feedback on your items and sites. And of course, you can use Twitter to talk with other artisans and form new friendships. If you're looking for more important on Twitter, try asking members of the community or doing a specific search for what you'd like to know.